Greek Default Watch: Is Argentina a Model for Greece? For the past few days, and a result of an op-ed in the NY Times by Mark Weisbrot, there is more buzz about the merits of Greece leaving the Eurozone. I have written about this subject in the past, but I thought I would make some more observations about this idea. Before looking more closely at the analogy, permit me two metaphors: Greece as a gambler with a debt problem and Greece as a fat prostitute. Now, the gambler can declare bankruptcy – the debt is gone, but the underlying cause that created the debt (the gambling addition) is untreated. Now think of the prostitute – her options to get more business are to hit the gym and eat right or to lower her price. In effect, the argument for Greece to default is akin to the gambler declaring bankruptcy but skipping out on the gamblers anonymous meetings; and dropping the euro is akin to the prostitute lowering her price. In other words, it solves a problem, but not *the* problem. Greece’s external balance is much worse than Argentina’s was before 1999: Argentina was running current account deficits of ~3.5% of GDP, while Greece’s 2010 current account deficit was 8.5%. So a sharp depreciation that would result from Greece exiting the euro would produce a more significant dislocation in Greece than in Argentina. Greece has a lot more state than Argentina: Argentina’s government revenues and expenditures were averaging ~25% of GDP before the crisis. By contrast, Greece’s numbers have ranged from high 30s for revenues to mid 50s for expenditures. So Greece needs to make a sharp curtailment in the state sector – neither default nor a new currency accomplishes that. Argentina has failed to produce macro-economic stability with inflation ranging from 8% to 10%, with one exception (2009). In other words, it has not resolved the propensity to run budget deficits – it has just shifted the financing mechanism from borrowing to printing money. Argentina is ranked 105th in Transparency International’s Corruption Perceptions Index 2010, tied with Algeria, Kazakhstan, Moldova and Senegal. In 2001, it was ranked 57th. The Heritage Foundation / Wall Street Journal Economic Freedom indicator shows that Argentina has experienced a sharp decline in economic freedom over the last ten years – the drop is similar to that experienced by Venezuela and just smaller than Bolivia’s. Looking at one sector I know well – natural gas – Argentinean is in a free fall: production, despite ample reserves, has fallen as companies refuse to invest. Exports have almost halted and imports have grown rapidly. Subsidized prices are fueling an unsustainable supply and demand dynamic. This subsidy to the rest of the economy has produced growth – but at a huge expense of an industry that will hit a brick wall unless it reforms quickly. I know these observations do not cover the Greece-Argentina comparison fully. There are indeed some positive numbers to look at in Argentina. But did default help Argentina resolve structural weaknesses in its political economy? Not really. And so the question is this: is Greece’s problem debt or is it a corrupt political system, an inefficient public sector built on clientelism, a highly regulated private sector that restricts competition and hampers entrepreneurship, and a weak state that cannot collect taxes or enforce decisions? If anyone thinks that taking off a few zeros from Greece’s debt or switching to a new drachma will eliminate these chronic problems, they are out of their minds. 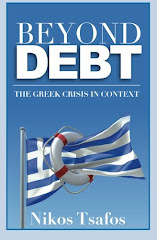 Greece faces a deep political crisis, not a debt problem. It needs political solutions, not financial engineering. Hi Niko, being an Argentinean, let me comment on the Argentine bit (with a big caveat that I'm not a big fan of current politics and situation). Argentina grew by 8-9% 4 years in a row before the 2008 crisis and by 9% last year and aiming at 7% this year again (in 2002 after our crisis, it dropped 20%!!!). Debt/GDP in Arg is in the 40-50% area, much lower than many other countries in the world. There is a resent report by UBS comparing Brazil's performace vs Argentina in the past 10yrs, showing that in numbers (numbers, not institutions/education!) Argentina did much better (will send it to you, I was surprised, but numbers are not everything, don't get fooled). The inflation (much higher than 10%, measured by private consultants) is indeed a tax to society. Gov financials have been deteriorating yet again in the past years, but are in much better shape that it was 10yrs ago. Argentina post default grew strongly aided (in part) by a prosperous commodity sector (farming, which benefit from high international commodity prices), which is a very dynamic sector in terms of investment (foreign investment, roads, ports, warehouses), techonlogy (genetics, oils) and wealth creation (outside the main city). I still fail to find what sector/industry will drive Greece into the needed growth (tourism won't if Greece is as expensive as other mediterranean countries). Still not sure if Greece has to default, its clearly a very painful process. Argentina has yet not been able to finance themselves in the international mkts (lawsuits still going on in NYC) and to many Argentina is a bad word in the financial world, which stops a lot of needed investments in the country. As you say in your last paragraph, I think Greece its a combination of all those problems. A corrupt country with perverse mechanisms that stops changes being made (that's why you reach a crisis, where its the only chance to have severe changes happening). The protectionism found in greece shouldn't survive (certain things are 20-40% higher in greece than buying them in italy). If Greece leaves the Euro it won't be able to go through the much needed changes (Gov is not strong enough, and in the Euro it has the pressure/support from the other Governments + IMF). Whatever happens in Greece (default, restructuring, sale of assets, de-regulation or any other reform) needs to happen fast to remove the country from uncertainty and allow people to consume/invest and start thinking in the future and not suffering in the present (Argentina economy was "stopped" during the last 3 yrs before default & devaluation. (some people can argue that it the suffering was even longer)). Argentina never decided to do the much needed reforms and went down the "easy" path in 2002.